Melbourne, Australia: Lothian Publishing, 1987. Text/BRAND NEW. Illustrated soft cover/NF w/faint creasing to front cover. Practical handbook on plant progation of shrubs and trees, from seeds and grafting. Detailed guidelines augmented by illustrations. First published in 1976, this copy is the 2nd reprint of the First Paperback Edition of 1986. Fine copy.. Reprint of 1987. Paperback. Near Fine/None As Issued. Pownal, VT: Garden Way Pub Co, 1984. Text/BRAND NEW. Illustrated soft cover/NF. Guide to growing Chinese vegetables with recipes and hints on how to cook them. Text in 2 parts: Part I, The Chinese Vegetable Garden; and, II, Container Gardening with Chinese Vegetables. 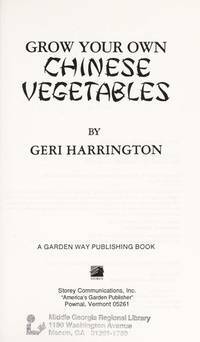 Geri Harrington is the author of four cookbooks. In this volume shares ways to multiple choices in herbs and vegetables from Asia.. First Edition, First Thus. Soft Cover. Near Fine/None As Issued. Harmondsworth, UK: Penguin, 1977. Text/BRAND NEW, showing faint margin discoloration. Illustrated soft cover/NF. Leading English horticulture journalist Ronald Menage introduces the various facets of greenhouse gardening and supporting gardening techniques of composting, potting and pruning. Fine copy.. Revised Edition, First Thus. Paperback. Near Fine/None As Issued. Illus. by Gunnar Edwards (Illustrator).